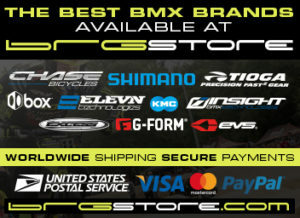 With most BMX Racing Teams, race results & bike sales are usually the main goal of the program. The exception of this is with the Dale Holmes Racing (DHR) team, as they are thinking outside the box. 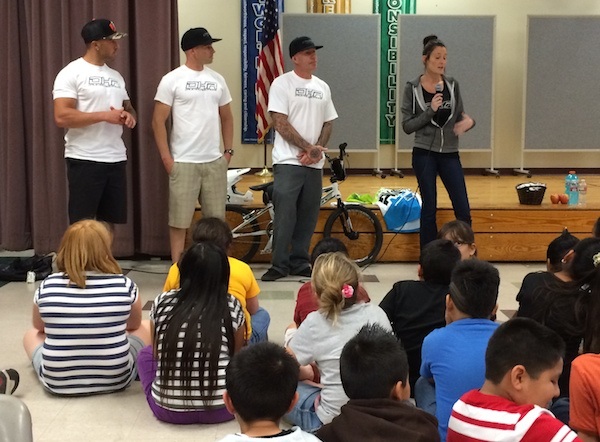 Not only are they an Elite level BMX Race team, competing on the USA BMX National and UCI BMX International Tours, but they are taking BMX racing to the kids away from the track, by visiting schools in the San Diego Area and teaching bicycle safety, helping kids learn the benefits of a healthy, sport filled lifestyle, and introducing BMX to a lot of new kids. 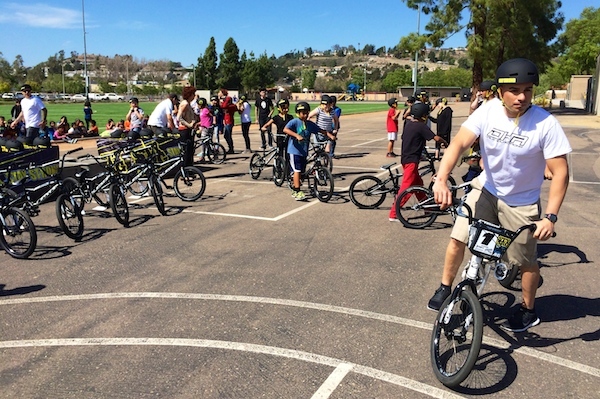 Dale Holmes, a 5-time BMX World Champion and British Cycling Hall of Fame inductee, along with his wife, Adrienne Wells Holmes, and the Dale Holmes Racing Team have partnered with the Poway Unified School District for a new after-school program, the Ride to End Obesity. “Ride to End Obesity” is part of the After-School Education and Safety (ASES) program for grades sixth through eighth. 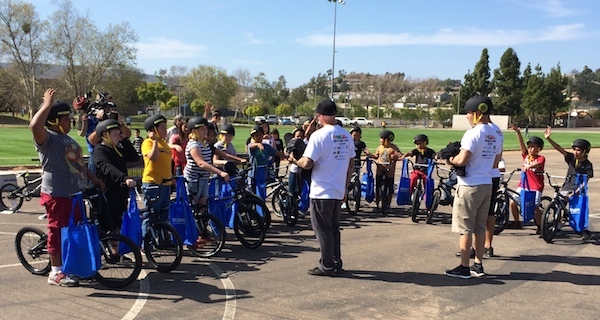 The BMX program is currently being offered at Bernardo Heights Middle School, Black Mountain Middle School, Meadowbrook Middle School, Mesa Verde Middle School and Twin Peaks Middle School, all in the San Diego, CA area. The 90-minute program includes basic instruction on BMX riding by the DHR Chase/Stay Strong team Pro Riders including 11-time national BMX champion and Olympian Cristian Becerine, Australian 2013 Series Champion Anthony Dean and amateur BMX rider Bryce Betts, with the overall program being hosted by Halee Kalevitch and Adrienne Wells Holmes . Holmes and his companions will focus on teaching students about the benefits of healthy eating, the importance of exercise, and general BMX riding. 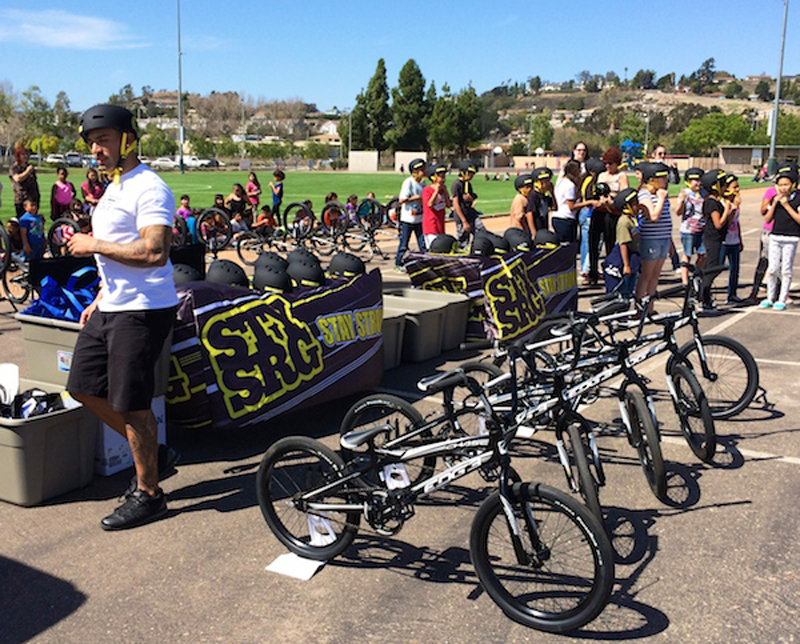 The DHR Team brings 40 Chase BMX bikes and helmets to each event and sets up a small obstacle course for students to try riding, after the 30 minute discussion. 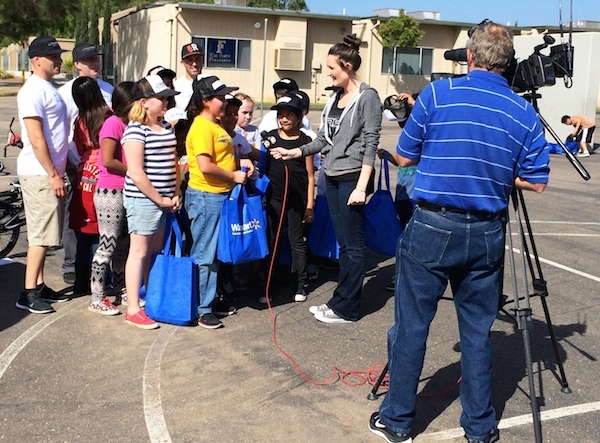 The “Ride to End Obesity” program is being sponsored by the Poway and Santee Walmarts and Barona Resort and Casino, with no cost to the school district. Each rider at the seminar not only gets the knowledge from some of the best riders in the sport and the chance to ride the bikes, but they also receive a Wal*Mart goody bag, full of healthy products for the students, a T-shirt, as well as coupons for their families to use on healthy food in the stores. “Ride to End Obesity” is acting as a pilot program at the selected middle schools. “If it’s successful, we plan to expand to other grade levels,” said Holmes, “as well as other school districts.” Holmes said that the San Diego Unified School District has also expressed interest in their “Ride to End Obesity” program.